Most returned, of course, alive and moderately fit from the hippy trail. They may have failed to change the world, but they certainly changed Mykonos. The violinist Yehudi Menuhin had a holiday home on that island which he visited in 1976 after an absence of nine years (he had honourably refused to enter Greece during the military dictatorship). Menuhin was stunned to find Mykonos overrun by 'naked Beatniks of all sexes'. He wrote to the mayor, explaining why he would no longer be holidaying in the fallen idyll, and his letter found its way into the Athenian national newspaper Kathimerini. He spoke of the 'locusts' invading Greece and of Mykonos in particular becoming 'an island of ill fame'. In less than a decade, Menuhin lamented, 'your noble Mykonos, where the visitiors came for its own uniqueness and its proximity to the sacred island of Delos, has acquired the reputation of a place for all and every kind of decadence', a decadence which was 'costing you the best kind of foreigner' -from High Sixties, the Summer of Riot & Love by Roger Hutchinson. Recent discussions about making classical music more inclusive reminded me of that story. But Yehudi did so many wonderful things we can excuse him a temporary lapse. In the header photo he is, of course, with Ravi Shankar and EMI's budget 2 CD Shankar set captures the two together on disc. Menuhin achieved rather mixed success as a conductor but his late 60s recordings of Schubert's Symphonies 1 to 6 for EMI are a personal favourite, although they are now only available as a download. His later recording of the complete Schubert symphonies with the Sinfonia Varsovia for Warner received excellent reviews and are still available as a budget box, but I have not heard them. But back to Greece and Leonard Cohen on Hydra and Joni Mitchell on Crete. Interesting piece. "Temporary lapse"? Well, OK ... but I suspect he was not all wrong. I must dig into the LP shelves; I have at least one with Menuhin and Shankar. 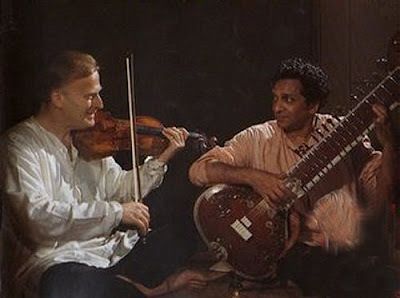 To wander down another path, it brings to mind an item on the excellent DVD "Julian Bream: My Life in Music" which has Bream improvising with Ali Akbar Khan. Each was playing at the Edinburgh Festival. Bream had expressed a desire to meet Ali Akbar Khan, who he greatly admired. In addition to chatting, they did this bit of music, apparently in the morning before they each went to the airport to go their separate ways.